We laid Koko to rest under a mound of rocks to protect her on her long journey over the frozen trails of death in much the same way that we failed to protect her on her short, sweet journey through life. As we laid the last stones on her final resting place we expected her father to lead one final serenade to carry her small, perfect spirit away; all that carried on the wind was the sorrowful silence of a kennel missing a friend. Instead the dogs all lined the fence of the kennels in apparent deference, watching this strange funerary procession that only a human can comprehend and mourn over. team this year, she had showed such promise that we expected her to be one of the primary leaders for years to come; she was going to go back to Britain to sweep the boards at the Championship shows as we knew she would. 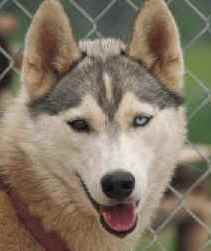 If we could ever find a stud dog that was good enough for her, she was going to be at the foundations of our lines. She was to be our beautiful little Koko for ever more, always happy and full of life. She is no longer happy and full of life and nor are we; we are more devastated and distraught than we could ever imagine. We are sorry for ourselves as there is something missing from our lives, we are sorry for Cassie who has lost her best friend, we are sorry for Poppy who has lost her special daughter and constant companion but most of all we are so, so sorry for beautiful, sweet Koko. 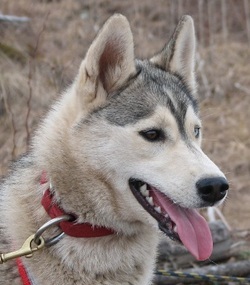 After eleven years of owning Siberian Huskies Koko is the first one we have lost. To say we are devastated would be a gross underestimation; we had such very high hopes for Koko and she was such a beautiful and sweet girl. The fact that she was taken from us at such a young age and in such quick and tragic circumstances seems to add to the pain and emptiness. Koko will always live on in her siblings, in her parents and in our hearts. We all miss you so much Koko, take care.